Wind, unicorn, and boy merged into a single swiftness. 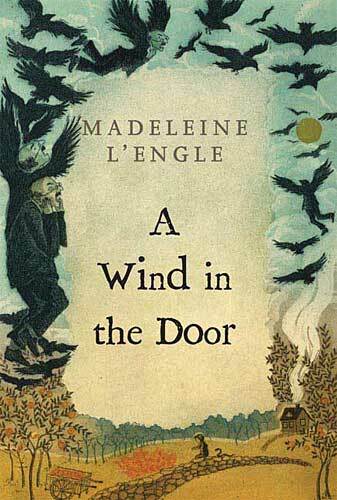 Reason for Beginning: I continued on from A Wind in the Door because L’Engle’s writing is consistently engaging and her stories powerful. Reason for Finishing: See above. Nothing’s changed. Story Re-readability: I might reread this eventually, but not for some time. It’s an easy reread because the narrative style is so beautiful and well-paced, but none of L’Engle’s books have quite elevated themselves to my Pantheon of Books, as it were. Author Re-readability: Even though now, after this book, I am taking a break from L’Engle to focus on other authors, I will easily come back to her in the future. She is one of the most readable authors I have read, for beauty and clarity of phrase, for interesting ideas, and for organic plots populated with warm, well-developed characters. Recommendation: It is completely possible to read this book, or the two before it, independently and without having read the others. 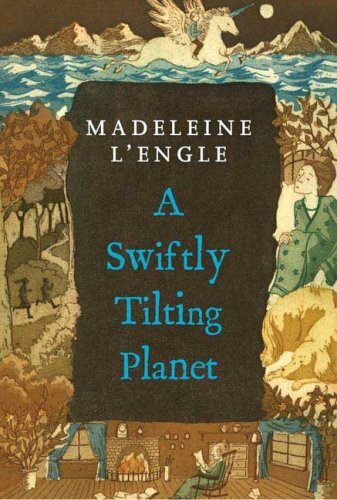 Thus I would heartily recommend A Swiftly Tilting Planet to anyone interested in the subject matter, even if they don’t want to or for some reason can’t get a hold of A Wrinkle in Time and A Wind in the Door. Fans of L’Engle’s previous books will want to see how the Murry family has grown and developed in the intervening nine years. In fact, this may be my favorite of the series so far, though that’s not to say it is perfect. But the bottom line is, this is excellent storytelling of the kind we too rarely receive. I may end up saying more negative things than positive things about this book, so keep in mind that A Swiftly Tilting Planet is quite close to being my favorite of the first three books. It is more beautiful, and in some places more powerful, than either A Wrinkle in Time or A Wind in the Door. This third book, though, has more elements that I think hold it back from being the best expression of its story. A time-traveling unicorn is a greatidea. A winged unicorn that literally flies through time and drinks moonlight and fights demons with a telepathic boy in order to avert a nuclear apocalypse is a fantastic idea. It leads to some beautiful images that cry out to be illustrated, or perhaps even animated. The wings are described as larger in the book. I like that L’Engle skips about nine years to show us a fifteen year-old Charles Wallace and a married-and-pregnant Meg. We see how they have grown up, but they are still recognizable as the same characters we love from the previous books. The narrative device of Meg sitting at home and kything with Charles on his adventure is welcome and useful. 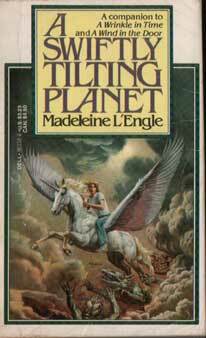 The time-traveling is streamlined because only Charles and Gaudior, the unicorn, are involved, but whenever the plot threatens to become confusing, L’Engle brings the reader back to Meg, who can puzzle over what has happened and give the reader some clearer answers. Because the time-travel is used to explore two branches of the same family over millennia leading up to the present day, the interlocking genealogies and Might-Have-Beens can start to blend together. History buff that I am, I love the time-travel aspect. It gives L’Engle the opportunities to greatly vary her cast of characters and, thematically, reveal the hand of God throughout history. Unfortunately, she doesn’t make the best use of these opportunities. The characters I will discuss in the next section, and her theology in the final section, but from a story perspective I feel that her portrayal of the Native Americans is lacking. The “People of the Wind,” she calls them, and they are all uniformly perfect, almost magical people in touch with their past (and God, by other names) and unfailingly kind and tolerant; always the best of the good guys. Since I know L’Engle is capable of more complexity, I wish she would have spent more time making the Native Americans more realistic and less of a caricature with all the right answers all the time. My other problem with the story is perhaps more subjective. Some time-travel stories have the past set in stone as utterly unchangeable, while others, like this one, have the hero changing the past in order to avert disaster in the present. The upshot is that when the hero returns to his present time victorious, it is a different present time than the one he left. So when Charles Wallace succeeds (not much of a spoiler, really) and returns to the night that started it all, his family remembers different events that night than he does, because the events Charles Wallace and Meg experienced literally did not happen for them. It’s like when sci-fi stories solve the public exposure of aliens by erasing everyone’s memory. I never find these endings satisfying, because they erase the experiences and struggles that have led to the characters’ growth. The other Murrys were learning a lot and growing so very much in their different reactions to the specifics of the nuclear threat that when it’s all erased and made “okay” by Charles Wallace’s tampering with history, it feels like a letdown. Why negate all that character development? The greatest strength of the series is the Murrys themselves, who are consistently a healthy, intelligent, affectionate, and complex family. While Meg and Charles Wallace are the designated odd ones of the family—that is, less socially adept and more worried, but also more cosmically significant, than the others—I like it best when all six members are working together as a unit. They would make a potent force if they ever went on an adventure all together. Charles Wallace still suffers from overconfidence in his own abilities and a tendency to try to take things into his own hands, but generally he has matured believably from his six year-old self. He’s more likable than in the previous books, where he would sometimes be a little too solemn and wise. Gaudior the time-traveling winged unicorn is a welcome addition, fulfilling the role each book has of an otherworldly guide and mentor. I don’t get why he is always blowing silver bubbles; it’s a weird image, but I suppose L’Engle decided it was whimsical enough to seem properly strange. But Gaudior is a fine character. I like him even more than Proginoskes the cherubim in A Wind in the Door (who was quite a nice fellow himself, if a bit prejudiced against humans at the beginning). He’s gentle, wise, and forgiving, with a touch of good humor beneath his sober surface. He reminds me very much of Falcor the Luckdragon from The Neverending Story. Lots of time spent with the people Charles Wallaces goes Within, so that there is quite a large cast of characters. Each family in each period of time that he visits is a descendent or ancestor of the previous one, and the same few names crop up with slightly different spellings throughout: Madoc, Madog, Maddok, Maddox, Matthew, Bran, Brandon, Zylle, Zyllah, Zillah, Zillie, Richard, Ritchie, Rich. Characters with the same names throughout history seem to essentially be the same person, or fill the same roles in their families. Thus Matthew is similar to Maddox, and all versions of Zylle/Zyllah/Zillah/Zillie are beautiful, sensitive, wise young women, though they live hundreds of years apart. Likewise, both Duthbert Mortmains are mean, dumb, lustful brutes. I suppose it is convenient from a storytelling perspective, but it carries the unfortunate implication that anyone who carries the name of a disreputable ancestor is destined to be just as disreputable, free will not seeming to enter into the picture. Similar to the problem with L’Engle’s portrayal of Native Americans is her portrayal of the early Pilgrims and Puritans, which is embarrassingly shallow and clichéd. They have one good representative in the Llawcae family, who are fine, godly people who are well-versed in Scripture, but one gets the sense that they are only so good because they are designated thus from a story perspective. All the other Puritans are portrayed as small-minded sheep who follow the demagogical Pastor Mortmain, a hysterical witch-hunter full of false superstitions. This one-dimensional caricature believes that singing is inherently evil and at one point actually cries out “Storytelling is of the devil!” (145) Having an over-the-top villain is one thing, but L’Engle uses Mortmain as her representative of the culture of that time, and I believe it’s a gross misrepresentation. She really should know better. Delightfully, L’Engle’s writing is even more beautiful and poetic than before. As always, she wastes no words but carefully chooses the right ones for maximum effect and clearest communication. She manages the tender balance between communicating the richness of her own mental image and allowing the reader’s imagination to embrace the scene and own it. As the baby [unicorn] had been following Gaudior in the steps of the dance, so it imitated him now, eagerly trying to drink moonlight, the rays dribbling from its young and inexperienced lips and breaking like crystal on the snow. Again it tried, looking at Gaudior, until it was thirstily and tidily swallowing the light as it was tipped out from the curve of the moon. From an orthodox Christian perspective, L’Engle’s theology is getting more suspect, unfortunately. Charles Wallace is brought through various ages of the Earth, and it becomes apparent that L’Engle is using an evolutionary schematic for the planet’s development. There is no Adam and Eve—rather, she seems to say that the earliest human groups were pure and unfallen. Unfallen, that is, until some early humans were corrupted by Echthroi and discovered violence. She has this happen to Europeans first, and later spreading to the ancient Americas. This is a bizarre rewriting of biblical history that makes no sense from a spiritual perspective, as it negates the rationale behind Christ’s Incarnation and sacrifice. The Bible specifically says that sin was passed directly from Adam by his bloodline to all of humanity. (Romans 5:11-2 “And not only this, but we also exult in God through our Lord Jesus Christ, through whom we have now received the reconciliation. Therefore, just as sin entered the world through one man, and death through sin, and in this way death came to all people, because all sinned.”) Thus Christ became of that bloodline and redeemed it. In L’Engle’s rewriting, this redemption is impossible. Also, her most holy and Christian-seeming people are usually old pagans, like the Native Americans, who are in tune with the Old Music and follow God by different names. Unfortunately, she never mentions Jesus Christ or redemption, and seems to think that these primitive beliefs are the actual, pure worship of God rather than shadows that, while pointing the way to Christ, do not provide salvation themselves. She borrows the form of Lewis and Tolkien’s metaphors without the substance. 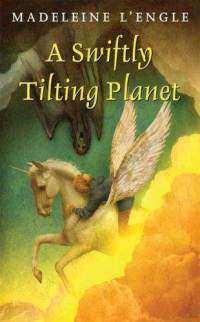 I do heartily recommend A Swiftly Tilting Planet to anyone interested in time-travel, fantasy, or anything related to this subject-matter, and especially to fans of the previous two books. The writing is very pretty and the story excellent. Christians will need to be aware of the book’s serious spiritual errors, but that should not preclude us from enjoying the good that is present. We need more books of this storytelling caliber. Reason for Beginning: Continuing on from A Wrinkle in Time. Reason for Finishing: L’Engle sure knows how to write a page-turner. Story Re-readability: I don’t plan on rereading it since it isn’t as strong as A Wrinkle in Time, although I wouldn’t lament doing so if I had to. It’s a fast-paced read with plenty of good, creative ideas. Author Re-readability: Her ideas are still fresh and poetic, her characters sympathetic and intelligent, and her writing sharp and energetic. Apologies for the generic adjectives, but I think they all apply. So far, I have confidence that in picking up any L’Engle book I would be treating myself to a good story, well told. Recommendation: Yes, for anyone who liked A Wrinkle in Time. Whether it is quite as good as that book is a matter of debate—I think it lacks some of Wrinkle’s poetry and interesting locales, but might have a stronger moral theme of the importance of loving even those people who seem unlovable. However, an increasing number of L’Engle’s narrative devices feel arbitrary or simply not as well thought-out as they should be, and her theology becomes increasingly worrisome. L’Engle’s books are among the few, recently, that have kept me reading late into the night, even as I lay tired in bed; for that I am happy and grateful. It’s a delightful and relaxing feeling to let go of the surrounding world and sink into her worlds of cherubim, mitochondria, and farandolae, confident that my imagination is in the hands of a skillful and eager storyteller. The story is not structured as strongly as A Wrinkle in Time, because there is far more talking and far less traveling. In fact, there is no traveling to exotic places at all until the second half of the book. Fortunately, the conversations are as lively and full of interesting ideas as before, and even when the pacing falters a little, there is still plenty to keep your interest. Still, this book has more obvious flaws than its predecessor. I like that L’Engle anticipates certain apparent paradoxes or questions the reader might have, and proceeds to answer them (sometimes immediately as they come up, sometimes later). But sometimes I still felt that her story was hampered by an occasional unwillingness to just be straightforward. She keeps everything as mysterious as possible as long as she can, and while mostly this is a great storytelling device that keeps up the tension and our interest, she often ends without giving us quite as many answers—or answers that make enough sense—as we deserve. Too many of the rules L’Engle invents seem annoyingly arbitrary, and her insistence on keeping her main characters as ill-informed as possible makes it feel less like they are making sovereign choices as being pulled (sometimes gently, sometimes not) to various plot points. The cleverness of the scene where Meg is faced with three Mr. Jenkinses, two of whom are demon-Echthroi imposters, and must Name the real one, is undermined by the illogicality of its context. It is unbelievable that the real Mr. Jenkins, having just arrived at school to find two identical men looking exactly like him and claiming to be him, would not immediately and angrily drive them out or call the police. Instead, L’Engle has him “play along” with what to him as a ridiculous game as he waits for Meg to Name him. He has no understanding of the cosmic events at all, or of what Naming is, and there is no good reason for him to interrupt his work day to put up with this. It’s lazy writing, in my opinion. Actually, the issues of Naming and X-ing are not explained clearly. Sometimes L’Engle says that Naming is forever—specifically, that Meg is forever Named—and yet key characters like Mr. Jenkins and Sporos, and even Meg at one point, must be Named and re-Named at certain points of the story. I think that to Name someone means to remind them of who they are in their soul, their essential nature, and that you have to love them truly. It also may have something to do with salvation, considering the importance L’Engle gives it—that is, having one’s name in the Book of Life. I think this because Naming is contrasted with X-ing, which at first is stated to be utter annihilation, or “unbeing, but in practice seems to be mere physical death. There is a huge gap between those two definitions, and L’Engle can’t decide which one she adheres to. The characters speak of X-ing as the most unimaginable evil thing that can happen to someone, but then when a certain protagonist (unnamed for major spoiler reasons) gets X-ed, it is stated that they are still forever Named, and that they still exist. So that, to me, implies that X-ing is simply killing, and a person who is X-ed is merely killed in a more supernatural-seeming way and is sent to Judgment before God. However, this is my extrapolation—L’Engle is unclear and contradictory on the matter. I cannot be sure because L’Engle herself seems confused on the issue. And it’s a rather important plot point for her to be confused on. L’Engle’s narrative style is still excellent. Her images are colorful and imaginative without overpowering the reader with big words and overly poetic phrasing. Every line of dialogue serves a purpose and felt consistent with the characters. This is especially impressive considering the final third of the book takes place literally inside Charles Wallace’s mitochondria, which is so inconceivably tiny that the characters do not even have the ability to see. Thus, there is no physical description in this part of the book, only mentions of surreal sensations as our protagonists kythe with each other (a kind of purely spiritual telepathy) and can sort of “feel” each other almost as if physically, but not really. It’s a somewhat confusing concept, but it works well enough. It’s a very bold risk on L’Engle’s part to have the entire climax take place in this area, and she struggles a little with conveying action with the limitation of being technically unable to describe it. For the most part, though, she pulls it off, and I enjoyed the challenge of imagining these scenes. As in A Wrinkle in Time, all is saved by the power of love, although here it is handled a little smoother. Rather than Meg having to find a way to love the impersonal IT (but not really), here she just has to love Mr. Jenkins, the school principal she hates and constantly butts heads with. In theory this should be easier for her, but in practice it is actually harder because she knows Mr. Jenkins and has had more time to build up a prejudice against him. In fact, Mr. Jenkins becomes the most interesting and layered character in the book, and it is his development that really kept me reading. This picture fits my mental image better. I can understand Meg’s dogmatic refusal to cease hating Mr. Jenkins, even if it became frustrating after awhile—it is entirely immature of her, but that’s fitting for her 15 years of age. She has difficulty even conceiving of loving him because his reputation for so many years has been that of a mean, unfair man, and his ignorance of Charles Wallace’s character has led to him to allow the boy’s bullying to continue unaddressed. My favorite part is when she remembers Calvin—now her boyfriend—telling her a story of when Mr. Jenkins took pity on him because his family was too poor to afford decent shoes and bought him a brand new pair, and then clumsily tried to dirty them in order to pretend they were old hand-me-downs (so as not to make his charity obvious, and thus potentially embarrassing to Calvin). Meg’s attitude towards Mr. Jenkins forms the thematic center of the book, and it’s this tender, considerate side of him revealed by Calvin that is brought out in the course of their adventures. Calvin himself is even more likable here than in A Wrinkle in Time. He’s far more rational, level-headed, and compassionate than Meg; his maturity is refreshing, especially since much of this book exposes her immaturity. Not that Meg isn’t likable—she certainly still is, and I enjoy the time spent with her as the main protagonist—but it is refreshing to see her faults acknowledged, so that she can grow by learning from the wisdom of others. And she does grow and mature. Proginoskes is a nice cherubim, although I dislike L’Engle’s trend of making all aliens and supernatural creatures as casual and petty as humans. Progo developed into a strong character, though, so I won’t hold it against him. Blajeny the Teacher fills the role of the Mrs. W’s in A Wrinkle in Time, but he is not in the book enough to really develop much, and generally serves L’Engle’s purposes by unloading huge responsibilities on Meg and then not explaining himself. He was kind of nice when he was around, but was not around all that much. Unfortunately, even considering her extremely sideways manner of addressing spiritual themes, L’Engle still manages to drift further from actual Christian teaching. Her casual mention of billions of years and evolution reveals a lack of confidence in the literal nature of Scripture. Also, the whole issue of Charles Wallace being some point of cosmic equilibrium, where his fate alone could determine the fate of the whole universe, is becoming increasingly improbable and annoying, and is rather suspect theologically. I know that ultimately this is fantasy, but L’Engle is still constructing a theological frame which has all the signs of being consistent, at least metaphorically, with her own religious beliefs, and this frame is not matching the framework of the Bible. On a far, far more shallow level, I just don’t like her insistence that Proginoskes is a singular cherubim rather than a cherub. Cherub, of course, is the proper singular form of plural cherubim, but when Calvin points this out, Progo just indignantly says that he is “practically plural” and resents the association of cherub with naked winged babies. But why does L’Engle feel the need to change English grammar? She gives no reason, no validation. It’s like she thinks that by being merely contrary she is being clever and original for her young readers, but that’s not the case. She is merely being arbitrary. It’s not a big point, but it annoyed me. Also, why bother to call dragon droppings fewmets? Fewmets is from the Old English word for the droppings of any hunted animal, whether deer or boar or fox, etcetera. Dragons, it should be known, are not typically hunted animals in the traditional sense, especially not in her book. I guess some other fantasy books or role-playing games use the term for dragons, but I really see no authoritative reason for it. It makes no sense! Argh! Ah well. It’s still a fine book, and a good one for kids to read. I’d just recommend that any Christian parents read it first and be prepared to discuss the story from a spiritual perspective with their kids.